Today's libraries are so much more to a community than just a place to check out books. 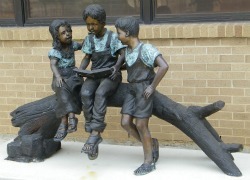 Computers and genealogy, children's story-time and book clubs, Nocona’s library is evolving to meet its customer's needs. 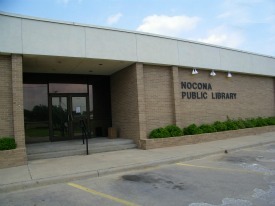 Nocona Public Library has all these resources and much, much more at its facility located at 10 Cooke Street, just off US Hwy 82. The library's book collection includes over 25,000 volumes covering adult, young adult, large print and children. Audio books and audio-visual media are also available for check out, along with an assortment of periodicals and magazines on a number of topics. The library maintains a large genealogy section, and reference items include many books that focus on local and county history. The library is open from 9:00am until 5:30pm Monday through Friday. Questions can be directed to the head librarian: (940) 825-6373. 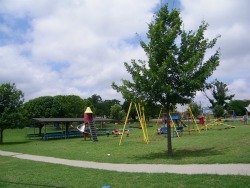 The Miss Enid Justin Park, supported by the Nocona Lions, features a variety of children's outdoor play equipment, a skate board ramp, two large pavilions complete with barbecue grills and picnic tables, two tennis courts and a volleyball court. It is located on the west side of town near the golf course. 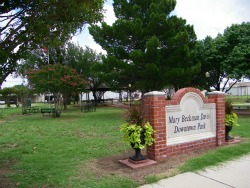 The Mary Beckman Davis Park downtown has benches and a small gazebo covered pavilion/stage and tree-covered lane.